The method for constructing the coefficients follows from §29.6. and (29.15.1) applies, with ϕ again defined as in (29.2.5). See Arscott (1964b, §9.6.2) and Ince (1940a) . This determines the polynomial P of degree n for which uE2⁢nm⁡(z,k2)=P⁡(sn2⁡(z,k)); compare Table 29.12.1. 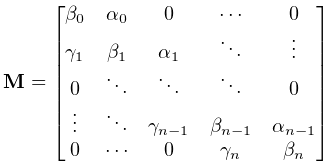 The set of coefficients of this polynomial (without normalization) can also be found directly as an eigenvector of an (n+1)×(n+1) tridiagonal matrix; see Arscott and Khabaza (1962) . For explicit formulas for Lamé polynomials of low degree, see Arscott (1964b, p. 205) .